The National Wild & Scenic Rivers System was created by Congress in 1968 to preserve certain rivers with outstanding natural, cultural, and recreational values in a free-flowing condition for the enjoyment of present and future generations. Fewer than ¼ of 1% of all river miles in the United States are given the “National Wild & Scenic” designation. Therefore, it's notable that the the Delaware River Watershed has six National Wild & Scenic Rivers: the Upper Delaware, the Middle Delaware, the Lower Delaware, the Maurice River, the Musconetcong River, and the White Clay Creek Watershed. The Delaware River's main stem has 60% (180.7 miles) of its 301 miles designated as National Wild & Scenic. 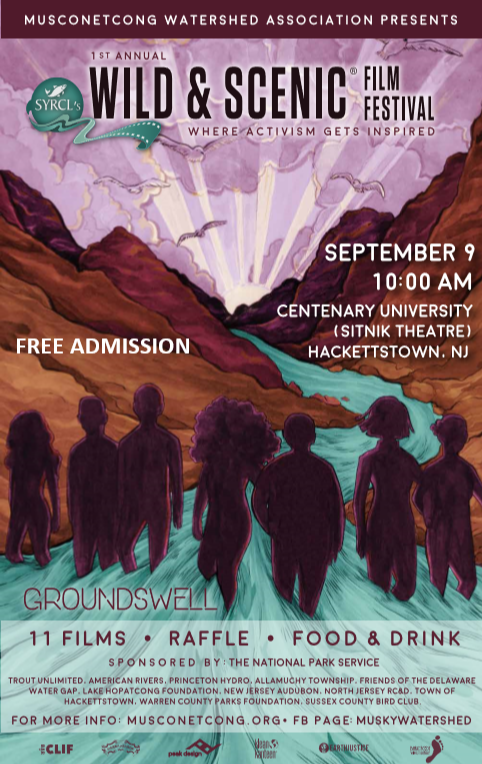 The Musconetcong Watershed Association is celebrating the 50th Anniversary of the National Wild & Scenic Rivers System with the Wild & Scenic Film Festival on September 9, 2018 in Hackettstown, NJ. In addition to the National Wild & Scenic Rivers System, Congress has designated 13 rivers as 'Partnership' Wild & Scenic Rivers in locations where the National Park Service (NPS) works with local stakeholders to protect outstanding rivers in a collaborative manner. The Coalition for the Delaware River Watershed recognizes the importance of Partnership Wild & Scenic Rivers, and included protecting this program in their policy priorities for 2018. The Musconetcong River, a Partnership Wild & Scenic River, was featured in a film produced by the NPS called River Connections. The NPS only made three films to celebrate the 50th anniversary of the Wild & Scenic Rivers System, with one film dedicated to Partnership rivers. The Musconetcong National Wild & Scenic River encompasses 24.2 miles, about half the river's length, of scenic and recreational areas. It is known for Outstandingly Remarkable Values due to its recreation (paddling, trout fishing, etc. ), history (the river includes seven historic districts), archaeology (including documented human habitation for over 13,000 years), natural scenery and vistas, and wildlife habitat. Because the Musconetcong River lies mostly on private lands, the river is managed through local partnerships via the Musconetcong River Management Council. Being a Partnership Wild & Scenic River means that local citizens worked to have the river recognized nationally and are directly involved in the river's management and protection. Included in the Wild & Scenic Film Festival will be a screening of River Connections and several other films featuring river, habitat, and conservation themes. Coalition for Delaware River Watershed member organizations helped to create some of the films that will be screened, including American Rivers and Trout Unlimited. In addition to film screenings, a panel of speakers will discuss river conservation issues and recreational opportunities on northwestern New Jersey’s three National Wild & Scenic Rivers: the Musconetcong River, the Lower Delaware (Harmony Township to Trenton), and the Middle Delaware (Delaware Water Gap National Park). The Musconetcong Watershed Association is proud to be hosting a film festival that simultaneously highlights these three Wild & Scenic Rivers, and are able to offer free admission due to the generosity of sponsors. This film festival is a pathway to inspire people to enjoy and protect these national treasures that are right in our backyard, which is what the National Wild & Scenic Rivers System is all about. Be sure to register for the September 9, 2018 film festival in advance, as seating is limited.